Nothing like getting up early on a Sunday morning to drive in blizzard like conditions to a softball game. That was how my day started. 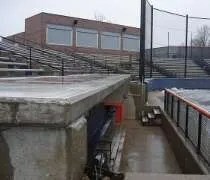 After getting rained out Saturday at Illinois Field, I made the trek back to Champaign/Urbana from my parents house for a softball game between the University of Illinois and Michigan State University. Unfortunately, the weather didn’t want to cooperate.